Samsung has teamed up with luggage maker TUMI for a special edition Gear S3, designed to appeal to the frequent traveler. This is still the same Gear S3 Frontier that launched last year, but the TUMI version comes with an Italian grey ('Earl Grey' to be precise) canvas strap and custom watch face to boot. Everything else from the 1.3-inch to the 4GB of storage remains the same, however. Like the new Louis Vuitton Tambour Horizon, Samsung is appealing to the travelers among you with the TUMI, although unlike the Horizon, which comes with special apps for traveling, Samsung's watch doesn't offer anything new in terms of features. 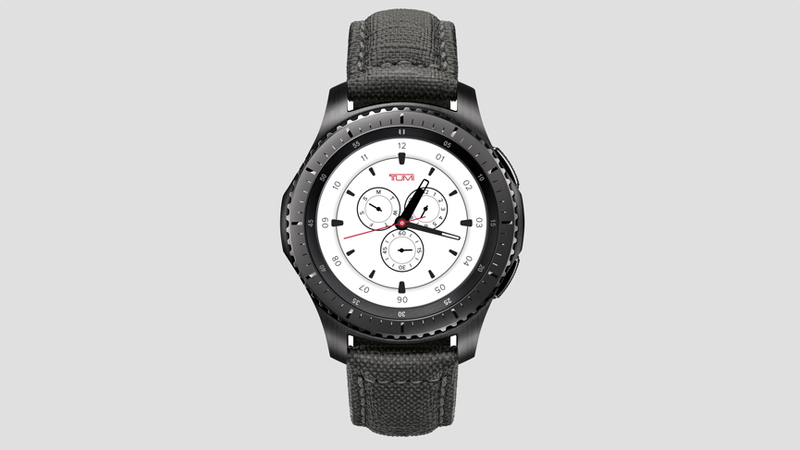 If your wrist is calling out for one, you can pick it up right now on Samsung's website, or in-store from 6 August, for $449.99 - $150 more than the standard Frontier. There's no denying it's a nice looking smartwatch, but it comes just a little late in the year; we're expecting Samsung to launched the Gear S4 possibly as soon as IFA 2017, which takes place in around a month's time. If you've been holding out this long for a Samsung smartwatch, we reckon it's worth waiting another few days to avoid any buyer's remorse.